I am one of those readers who likes to be hooked in the first few pages of a book. Once I’m drawn in I can read for hours oblivious of all else. Sometimes, though, getting into a book is a struggle. I once heard a review of GK Chesterton’s novel first published in 1908, The Man Who Was Thursday: A Nightmare. I asked for the book and received it at Christmas, never to read it. I get hooked on albums much the same way – a song or two will pull me in and then I want to know more about artist, the producer, who wrote each song, and all the instrumentalists on each selection. The song that hooked me on The Bombadils‘ album “Fill Your Boots!” was “Noah’s Song” – based on the poem Wine and Water by none other than…GK Chesterton. Sarah Frank (violinist, vocalist) put the words to music and the rest of The Bombadils helped with the arrangement; Luke Fraser (mandolin, guitar, vocals), Anh Phung (Irish whistles, flute), and Alan Mackie (upright bass). This humorous poem about Noah’s concern for his wine cellar during the Great Flood gave me a renewed commitment to trying Chesterton’s nightmare book again – perhaps with a glass of wine. 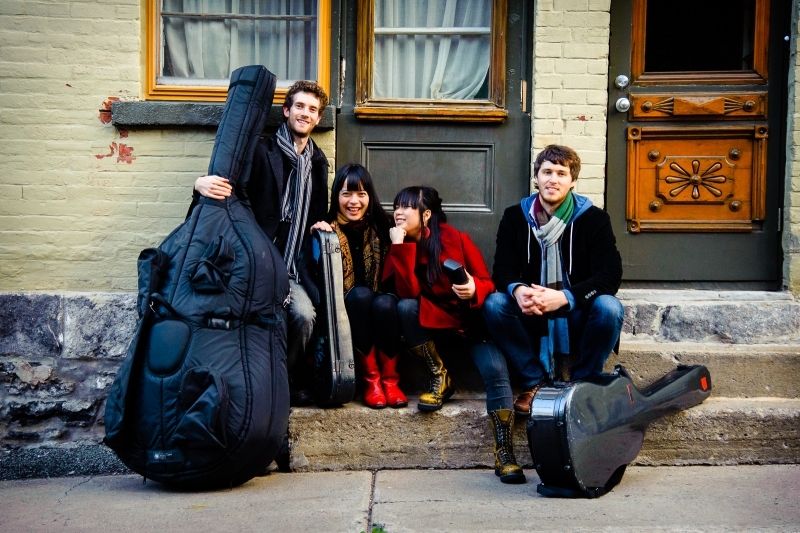 The Montreal based band The Bombadils will be at Chestnut House Concerts on Saturday, May 17, 2014. Potluck at 6:00 pm, Show at 7:00 pm. Contact Tim at 717-940-9311 or by email at tlehman9@gmail.com to reserve a seat. Suggested donation of $15/20. This entry was posted in For Your Information, Upcoming House Concert and tagged Alan Mackie, Anh Phung, Celtic, Fill Your Boots!, Flute, GK Chesterton, Irish Whistle, Luke Fraser, mandolin, Montreal, Progressive Folk, Sarah Frank, The Bombadils, The Man Who Was Thursday: A Nightmare, Wine and Water by chestnuthouseconcerts. Bookmark the permalink.